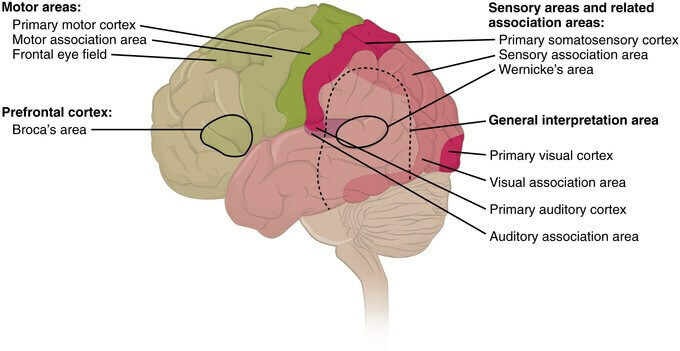 Both the upper and lower lips of visual cortex (area 17) are superimposed by visual association cortex area, area 18 and area 19, one over other. This area is concerned with recognition of an object and perception of its color. These are some reflex path, afferent components of which are formed by visual pathway. When light is projected on one eye (retina), normally, pupil of both eyes, which is a small circular aperture in iris, constricts. Constriction of pupil of the eye, on which light is projected, is the effect of direct light reflex. Constriction of the pupil of the eye, on which light is not projected, even if it is passively closed, is the effect of consensual light reflex, when light projects on another eye. Receptors: Rods and cones of retina. Afferent pathway: The fibers formed by chain of bipolar cells, ganglionic cells and their axons as optic nerve, optic chiasma and optic tract. Some fibers from optic tract, passing through superior brachium to pretectal nucleus of midbrain. Axons from prectectal nucleus, which is close to and at the level of superior colliculus, relay in Edinger- Westphal nucleus of oculomotor nerve of same side as well as opposite side. Center: It is Edinger-Westphal nucleus of oculomotor (IIIrd cranial) nerve. This nucleus is the parasympathetic efferent nucleus. Situated close to somatic afferent nucleus of the same cranial nerve at the level of superior colliculus of midbrain. Axons from this parasympathetic efferent preganglionic neurons travel via oculomotor nerve to supply two muscles, i.e. constrictor pupillae and ciliary muscles. Efferent pathway: Oculomotor nerve of same side as well as opposite side. Via nerve to inferior oblique, which is a branch from inferior division, preganglionic fibers relay in ciliary ganglion. Postganglionic fibers enter eyeball via short ciliary nerve. Effector organ: Constrictor pupillae muscle of same side as well as opposite side.